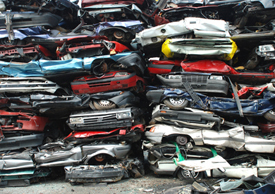 This summer marked the two-year anniversary of the Consumer Assistance to Recycle and Save (CARS) program, more fondly known as “Cash for Clunkers.” We know that the program provided consumers with a hefty chunk of money to trade in their older, inefficient vehicles for more efficient new ones. We also know that it provided a boost to carmakers and the economy by stimulating sales. Two years on, what more can we learn? With an eye towards informing future direct incentive programs, a new report from ACEEE entitled Cash for Clunkers: A Missed Opportunity for Fuel Economy Gains provides a new analysis of the fuel economy impacts of the program and their relation to program design. The performance of Cash for Clunkers in capturing fuel economy gains didn’t exactly blow our hair back. On the plus side, the program did accelerate the retirement of hundreds of thousands of the most inefficient light-duty vehicles. It also resulted in consumers’ purchasing more fuel-efficient vehicles than they otherwise would have, and in a surprisingly large percentage of former truck owners driving off the lot in cars. Yet the associated bump in fuel economy was small given the size of the incentive. On average, program participants bought vehicles with fuel economies 2.4 mpg higher than the light vehicle market as a whole — a 10% improvement — and 2.9 mpg higher than they would have purchased in the absence of the program. The program spent $4200 on that 2.4 to 2.9 mpg increment, on average, several times higher than other measures to increase fuel economy. This was partly due to very low program stringency. It was too easy for a CARS program participant to find a qualifying vehicle: approximately 68% of the new car and light truck market was eligible for one of the two voucher levels for the average participant, and more of the market was available for the higher $4500 voucher than for the $3500 voucher. All in all, Cash for Clunkers missed a big opportunity to achieve greater vehicle fuel economy benefits and was an unwieldy instrument for its — admittedly secondary — task of increasing the fuel efficiency of the nation’s passenger vehicles. Greater stringency of eligibility requirements, alone or in combination with lower incentive levels and wider participation, could have increased the fuel economy benefits of the program while preserving its stimulative effect on the economy. Future direct incentive programs for energy efficiency — such as Home Star, a.k.a. “Cash for Caulkers” — should take note of the successes and failures of Cash for Clunkers, and “right-size” to meet the task at hand.